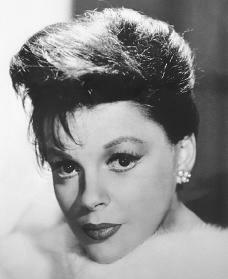 Judy Garland starred in films, musicals, and on the concert stage. A superstar who never lost her appeal, she is best remembered for her performance in The Wizard of Oz and for the song "Over the Rainbow." Judy Garland was born Frances Ethel Gumm on June 10, 1922, in Grand Rapids, Minnesota. She was the last of three daughters of former vaudeville (traveling variety entertainment) actors Frank and Ethel Gumm. Judy began her show business career before she was three years old at her father's theater, the New Grand Theater. The family soon moved to Los Angeles, California, and to better climates than those found in remote northern Minnesota. By age six she was a veteran performer, appearing with her two older sisters in a vaudeville act. After her father's health declined, the sisters' act soon became the primary source of income for the family. Mistakenly billed as "The Glum Sisters" in 1931, the sisters, at the suggestion of a fellow performer, changed their stage name to Garland (the name of a then-popular drama critic). Shortly thereafter, at her own insistence, Garland changed her first name from Frances to Judy (after a popular song of the day). In 1935 the head of MGM (Metro-Goldwyn-Mayer), a major Hollywood studio, heard Judy Garland sing and quickly signed her to a contract. There was some uncertainty at the studio on how to use her talents. A year passed before she made her first MGM film, a two-reeler. Her first appearance in a feature did not come until 1937, when she was loaned to another major studio, Twentieth Century-Fox. That same year at an MGM party for its star Clark Gable (1901–1960), Garland was a hit singing a specialty number, "Dear Mr. Gable," which was adapted from the well-known standard "You Made Me Love You." As a result she and the song were used for the 1937 feature Broadway Melody of 1938. Again she earned praise within the industry. MGM quickly put Garland into more films, each spotlighting her singing. In her next film, Thoroughbreds Don't Cry (1937), she was cast with another childhood star, Mickey Rooney (1920–), with whom she would later appear in eight films. MGM paired them in some of the Andy Hardy films, a series starring Rooney as an "average" American teenager. The duo performed in such movies as Babes in Arms (1939), Strike Up The Band (1940), Babes on Broadway (1941), and Girl Crazy (1943). Her most memorable film role, and the one that made her a household name, came in 1939 with The Wizard of Oz. She won a special Oscar as "best juvenile performer of the year" for her role as Dorothy. The film also provided her with the song with which she was identified for the rest of her life—"Over the Rainbow." During the 1940s Garland graced a number of outstanding musicals, including Meet Me in St. Louis (1944), The Harvey Girls (1946), and Easter Parade (1948). She was superb in a non-singing role in The Clock, a pleasant drama about a young girl and a serviceman on leave. Garland's personal life, however, was less successful. She married music arranger David Rose in 1941, but that marriage ended long before their 1945 divorce. That same year she married director Vincente Minnelli (1910– 1986), who guided Garland in some of her most notable films, including The Pirate (1948). Daughter Liza Minnelli (later a star in her own right) was born in 1946. This second marriage also failed and was over well before the 1951 divorce. All during the 1940s Garland was hampered by a lack of self-confidence, strained by constant work, and slowed by weight problems. She became heavily dependent on pills and in the end broke down, trying to kill herself in 1950. Once a professional talent and hard worker, Garland became a problem artist during the 1940s. The filming of In the Good Old Summertime (1949) was repeatedly delayed, as was Summer Stock (1950). A pattern had been set that would increasingly set back her career. She was replaced in a number of films and finally was fired by MGM in 1950. Sidney Luft, a successful promoter who later became her third husband (1952), started Garland on a career on concert stages. She was a smashing success at the Palladium in London, England, at the Palace Theatre in New York City, and elsewhere. The magnificent film A Star Is Born (1954) capped her comeback, and she earned an Oscar nomination. But faltering health, increasing drug dependency, and alcohol abuse led to nervous breakdowns, suicide attempts, and recurrent breakups with Luft, by whom she had two children, Lorna (1952) and Joseph (1955). The Lufts finally divorced in 1965 after years of legal wrangling. Notwithstanding her troubles, Garland undertook a highly successful concert tour in 1961, which was capped by an enthusiastically received concert at New York City's Carnegie Hall. The live recording of that event sold over two million copies. That same year she earned an Oscar nomination for best supporting actress for her dramatic performance in the film Judgment at Nuremberg. She had another non-singing role in the British film A Child Is Waiting (1963). Her last film role was in another British film, I Could Go On Singing (1963). Garland had made a well-received television debut in 1955 on the Ford Star Jubilee and had done well in other guest appearances. Unfortunately, her long-awaited television weekly series did not fare well, and CBS cancelled the variety show after one season (1963–1964). Garland's personal and professional life continued to be a series of ups and downs, marked by failing performances, comebacks, lawsuits, hospitalizations, and suicide attempts. After divorcing Luft she married Mark Herron, a young actor with whom she had traveled for some time. The marriage lasted only months. Mickey Deans, a discotheque manager twelve years her junior, whom she had married earlier that year, found her dead in their London flat on June 21, 1969. Death came from an "accidental" overdose of pills. She is buried in Hartsdale, New York. Judy Garland was a superstar who, as one critic pointed out, "managed the considerable feat of converting herself into an underdog." Despite all the lows in her life she remained immensely popular and had an appeal that was never entirely lost. Clarke, Gerald. Get Happy: The Life of Judy Garland. New York: Random House, 2000. Frank, Gerold. Judy. New York: Harper & Row, 1975. Schechter, Scott. Judy Garland: The Day-by-Day Chronicle of a Legend. New York: Cooper Square Press, 2002. Judy Garlands nick name was Baby Gumm. In the early 1950's Garland mostly worked in nightclubs, concerts and on television. My favourite movie is The Wizard of OZ,and in my school we are writing speeches so,do you think you could send me some extra info on Judy Garland? im doing Judy Garland for my wax museum at school!!! Judy Garland was put on diet pills during the making of The Wizard of Oz because the studio thought she was too chubby for the role of Dorothy. This began her life-long battle with prescription drugs. She was a phenomenal talent.